Try whole grain pasta for more fiber. Try pasta in a different shape, such as spiral or elbow. Best served immediately. Reheated broccoli changes color and might have a less pleasant taste. Cut chicken breast into bite sized pieces. Sauté pieces in oil in a medium skillet over medium-high heat (350 degrees in an electric skillet) until lightly browned, 2 to 3 minutes. Add water, bouillon, soup, pepper and garlic to skillet.Stir until smooth. Add pasta and broccoli. Bring to a boil. Cover and reduce heat to low. Simmer until pasta is tender, 15 - 20 minutes. Add a small amount of water near end of cooking if needed to prevent sticking. Add cheese during last two minutes of cooking. 7 Comments for "Chicken, Broccoli & Cheese Skillet Meal"
The first time I made this, I used garlic powder and it was absolutely amazing! 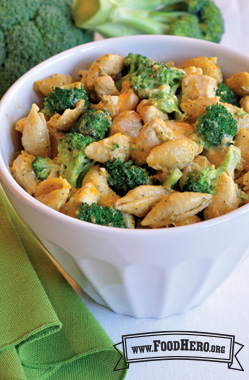 My husband can’t stand the taste of broccoli, but this recipe was delicious. The second time I made it, I used fresh garlic but it did not taste as flavorful. I believe it’s because I didn’t sauté the garlic first. So, if you go the fresh garlic route I highly recommend sautéing it first. Enjoy! We know this is a favorite recipe. We’ve made a few changes to keep the taste but make it more nutritious and cost less. The amount of chicken is reduced slightly and the broccoli is increased. We substituted water and bouillon for the canned chicken broth, which allowed us to use regular cream of chicken soup instead of the more expensive and harder to find low sodium version. We simplified the directions just a little. Yup! This recipe is still the overall favorite with my students (and family). Leftovers go REALLY fast, too. Loved this recipe! Not everyone in my house is a fan of broccoli, so I used chopped sweet onion and green bell pepper instead and it turned out great. I also topped mine with sauteed mushrooms. Yum! Great recipe - every family member came back for seconds! Quick, tasty and adaptive. We made it veggie with veggie broth, cream of mushroom soup, and 2 cups of beans. Do think veggie sausage would taste great too! Topped with hot sauce and a dollop of low-fat sour cream. Did use whole grain pasta and a bit more broccoli, both as the recipe suggested. We will make this again and again! This is such a yummy recipe! It's pretty easy to make and a fairly fast meal. This meal has it all, and it pleased the whole family! I topped it with a little cheese in the end right before serving, for a nice presentation. I really liked the cheesy taste and the spicy kick! Love to cook for your loved ones? Food Hero brings you a lot of family friendly recipes that everyone, even your kids will enjoy.